I'll be honest, I felt a bit burned out on new small Internet of Things devices after my previous experience with the Belleds Q. The Q shipped, but was immediately abandoned by the development team and left to die. I even tried to help keep things moving by creating some projects that I documented here and setting up a forum called IoTTalk to bring the folks hacking on the Q together, but it wasn't enough without the support of the project's founders who moved with no forwarding address. 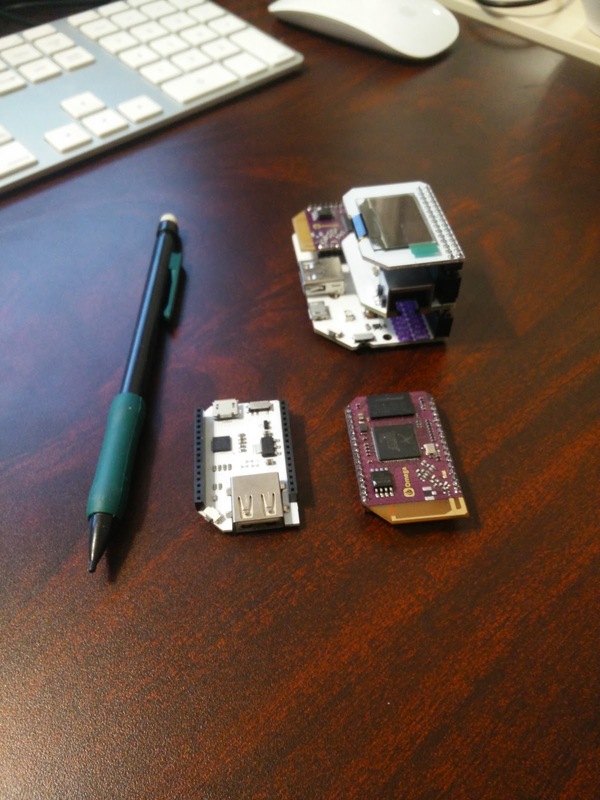 But a few months back, I joined in on the Kickstarter for the Onion Omega, a platform for prototyping and building Internet of Things devices. I'm happy to say that my experience with Onion couldn't be more different! The founders have been incredibly involved and responsive, interacting with the community on a daily basis. Seeing what people are already doing with this new platform and being part of the community is truly exciting! The Omega is a tiny development platform based on an ARM System On a Chip (SOC). It includes a 400MHz processor, 64MB of RAM, 16MB of onboard flash storage, WiFi, and a number of expansion pins that can be used for a multitude of purposes, all costing about $19. It barely sips power, being able to run for several days off of a common cell phone external battery via its USB power input. Some existing expansions provide USB ports, Ethernet networking, relays, and even a tiny OLED display! The Omega itself is about 44mm/1.75" along its longest axis, or about 12mm longer than a standard SD card. The best part for me is that it runs Linux natively. I've been hacking on Linux for a couple of decades at this point and am usually more comfortable with a command line than a soldering iron, so having a platform that I can start using from a familiar environment is huge for me. I've written up a few more tutorials (mostly aimed at people with limited Linux experience) over at the Onion Community site. For example, by installing a single package and using simple shell commands, you can blink the onboard LED in a Morse code message. 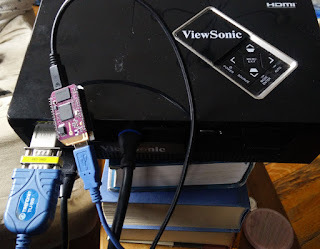 Slightly more usefully, I used some shell scripts and an Omega to act as a WiFi-enabled remote control for the serial port in my home projector. This is hundreds of dollars cheaper than any existing wireless serial system I could find and will allow me to connect my projector to a home automation system. 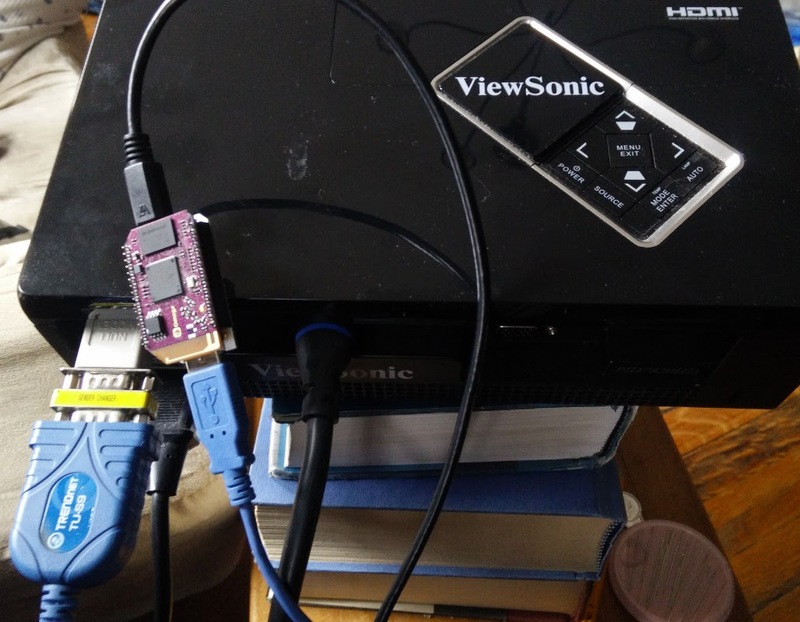 An Onion Omega and USB to serial adapter plugged into my video projector allowed me to duplicate a wireless serial adapter that sells for hundreds of dollars. The real beauty of this is that I didn't have to do any hardware hacking. All of the functionality is exposed through Linux, meaning a few shell scripts or a Python program is all I need to use the functionality of these real-world devices.